I started with a large and a medium round pan for this reindeer cake. 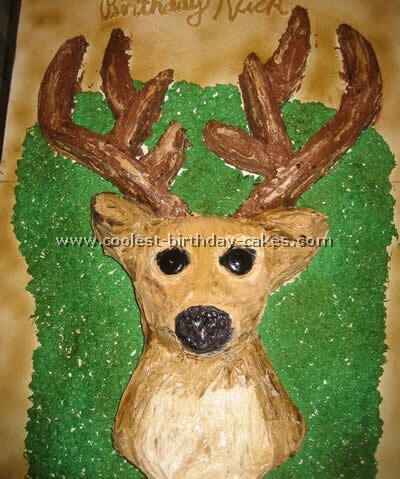 I carved the deer head out of the large round pan (including the ears)and pieced the antler together by cutting strips from the small cake pan and connecting them with chocolate icing. make sure to keep all of the cutting scraps incase of need for anything else. 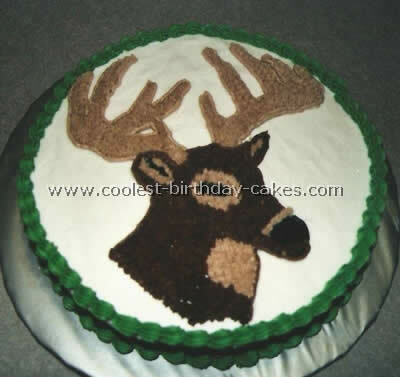 I then used chocolate icing to cover the antlers and white icing with brown cake color for the deer head. I then shaded in all the appropriate areas and followed up the green grass. Supplies needed: buttercream icing tinted green and creamy light brown, but leave the majority white. Chocolate buttercream icing, tint some black, leave the rest as is, cake mix of choice, Wilton piping gel, a disposable decorating bag and waxed paper. 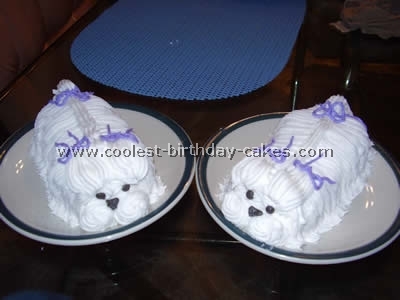 Bake a round cake and ice white. In Microsoft Word I found a deer picture and printed it. I then placed wax paper over the picture and put Wilton tip #1 in the disposable bag. The bag was filled with Wilton piping gel and was used to trace the detail of the picture onto the waxed paper. The wax paper was then flipped over onto the cake (beware this will reverse the image from what it originally looked like). 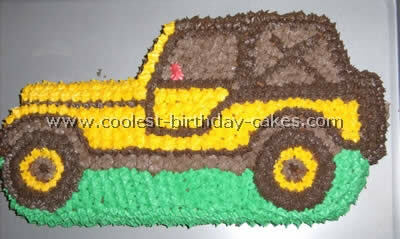 Gently run your hand over the image to help transfer to the cake. For this Reindeer cake, I used a round tip to outline the design and a star tip to fill the areas in. To finish the cake I added a shell border. I made a square fruit cake and covered it with marzipan then royal icing – creating the swirls with a flat knife. This is the base of the reindeer cake. 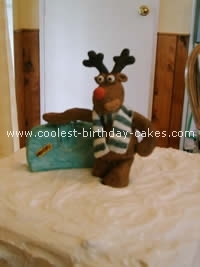 Robbie the Reindeer is modeled from fondant icing coloured brown then textured with the end of a cocktail stick. His limbs and antlers are all held in place using pieces of uncooked spaghetti. I also use ‘glue’ made from watered down royal icing (but I find a thick ‘paintable’ paste of icing sugar mixed with water works just as well). I propped his limbs up in place with pieces of foam. Once set he can be placed on the cake. The suitcase is made from a solid piece of white fondant icing – painted blue with diluted food colouring. 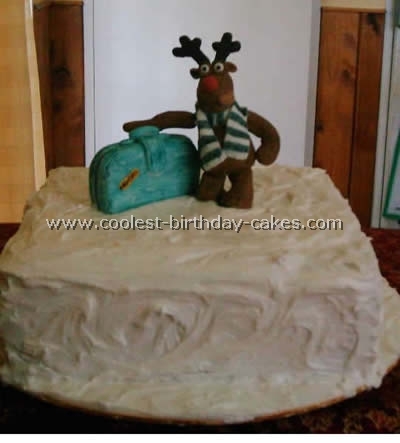 I made this reindeer cake from a picture off the Internet – taken from the animated film "Robbie the Reindeer – Hooves of Fire".